Last month, the entire world was shaken by one of the largest Ransomware cyberattacks in the history of the internet. The Ransomware known as ‘WannaCry’ was first discovered on Friday, May 12th, and by the end of the day had spread to an estimated 57,000 computers covering approximately 150 countries, worldwide. It essentially targeted computers running on Microsoft Windows operating system. The malware encrypted the files on a victim’s computer and demanded a ransom in the form of Bitcoin cryptocurrency to get them back. While companies and cyber security professionals were coming to terms and trying to contain this widespread contingency, the solution to this problem was much closer at hand than expected. A British security researcher who goes by the pseudonym ‘MalwareTech’ online, discovered that WannaCry was trying to connect to a seemingly random internet domain: iuqerfsodp9ifjaposdfjhgosurijfaewrwergwea.com. On checking the domain details, he found that this domain was not registered. 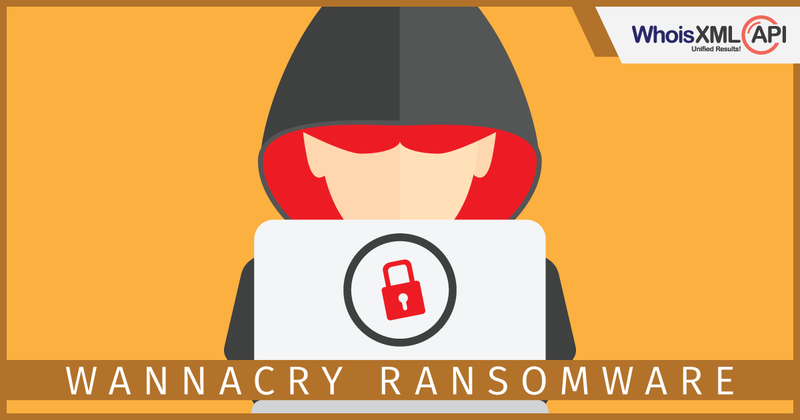 Hoping to find some further leads about the malware, he registered the said domain and voila, he accidentally bumped into the killswitch for Wannacry malware. Almost immediately, WannaCry stopped infecting new computers. Of course, this was just a temporary solution to a much bigger problem, and within the last one month already there have been more sophisticated malware like the Petya Ransomware attack looming over. Security professionals are going to play a very important role in the times to come. From highly analytical thinking and sometimes, as proved in this case, a lot of common sense to access to the right data can help keep these cyber criminals at bay. Every act leaves a trail, and it goes without saying, domains and IPs that are linked to malicious entities will need to be traced and tracked be it through Whois records, historic domain Whois records, DNS database and other relevant data. And we at WhoisXmlApi are completely dedicated to providing that back-end support to professionals in this fight against cyber crime! You can always rely on us to provide the most accurate, comprehensive and best domain data. We have various products and services for Cyber Security professionals, including a Cyber Security Data Solution Package specifically created understanding your data needs. For any further queries please do write to us at support@whoisxmlapi.com and we would love to help you with your data requirements.